The unrelenting sports news cycle, which keeps its head on a swivel runs a 4.4 40 in the world of the NFL, got some mileage out of Monday night’s sideline skirmish between Eagles’ wide receiver DeSean Jackson and Redskins’ corner D’Angelo Hall. Not only did Hall draw a mindless personal foul penalty for a late hit that was – both literally and figuratively – well out of bounds, but it came after Jackson had left Hall in the dust on a touchdown that was the centerpiece of the frenzied scoring spree that sent the Birds into halftime of their eventual 33-27 road win with a 26-7 lead and made them the source of league-wide buzz. Jackson bounced right up and shoved back, but drew no flag. 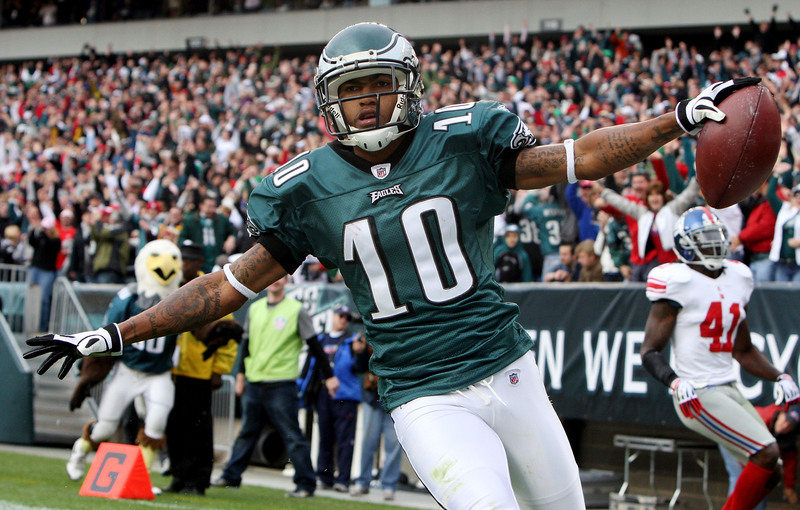 The two notoriously impulsive players, known more for being temperamental than temporal, continued to jaw during and after the next play, exchanging another shove while Jackson allegedly took time to flash a gang sign at the same player who taunted him prior to a 2010 Monday night game that ended in a huge win for the Birds. For those who sit on their high horse and look down in disgust at such unsportsmanlike behavior, perhaps it was. But this is Philly, the home of long-suffering fans impetuously waiting to end a 53-year championship drought of the franchise they would most like to see win a championship, if only because it is the team that has gone the longest without one. If an opponent got under Jackson’s skin last year, it was because the Eagles were losing and he was frustrated. And because of the negative karma swirling around the team, like flies to you-know-what, he would have surely been flagged for retaliating. This time around, the Eagles were winning and nobody was going to break his stride. Not even the official dared. When Jackson got into Hall’s face, it was a statement: You may have pushed us around in the recent past, but not anymore. Cast in that light, it was all good. The Eagles are coming off a 4-12 season, the last of the unnecessarily prolonged Andy Reid era. They have been that bad, record-wise, before. And they probably will be again. Who knows? Maybe even this year, meaning that Monday’s barrage was a mirage. But last season was played with no heart, no soul. It just wasn’t Philly, watching abominations like tacklers being dragged into the end zone and opposing receivers prancing across the middle like carefree kangaroos in the Outback. This is supposed to be the place where the fictional Rocky Balboa was so believable because of the backdrop. Instead, it was like having a cheesesteak with tofu instead of whiz. The Eagles were getting knocked down, and not getting back up. They were throwing in the towel. And the coach, Reid, uttered one-word answers and acted like the long-suffering fans wouldn’t understand the devilish details if he did care to explain. He was canned on the last day of 2012. Chip Kelly, after initially turning down the job, was hired a few weeks into 2013. At his introductory press conference, the wunderkind from the University of Oregon, by way of New Hampshire, said he had spoken with a gracious Reid and declined to take the bait and say anything negative. Owner/Whatever-Else-He-Calls-Himself Jeffrey Lurie spoke glowingly about Reid as well, talking about a day – certainly not next Thursday night, when Reid’s Kansas City Chiefs come to town – when the coach who went 1-4 in NFC Championship Games and 0-1 in Super Bowl appearances during his 14-season run would be honored by the franchise. And then all hopeful, albeit skeptical, eyes turned toward the future. There was a solid draft (on paper), post-workout smoothies, racial epithets at a country concert, a quarterback controversy, a 2-2 preseason and peculiar final cuts that left us with as many question as answers about an overhauled roster and new schemes on both sides of the ball. In reality, it was a way to pass the time until the season-opener against the Redskins, which the rest of the nation saw as more of a return of Robert Griffin III from offseason knee surgery, with a cute sub-plot about Kelly’s fast-break offense that probably would come up short on the scoreboard but would be fun to watch. And then came game time, and the clear signs that this Eagle team under Kelly couldn’t be any different than Reid’s. Introductory press conferences and first days of mini and training camps aside, it marked Kelly’s arrival. And Reid’s departure. The ghost of Big Red was officially put to rest Monday. Call it an exorcism. Post-game, holdover players talked about having pure and unadulterated fun for the first time in their pro careers. If that was enough of an indictment of Reid, and how stale of a soft pretzel with no mustard his approach had become, Kelly inadvertently kicked dirt on the grave of his predecessor with a comment in a post-game press conference in which he said more of substance than Reid probably did in a season. He then added that he, like the players, had fun as well. Reid, as we know, took himself way too seriously to have fun coaching what is a game. The players are professionals, not kids at recess, but it was still obvious they were following his dour lead in the way they went about their business. Make no mistake, winning helps. And the Eagles won Monday. But the change in culture, which is probably more important than the won-loss record this season, is alive and real. The standard prediction for the Eagles this season falls between 5-11 and 7-9, and Monday’s win – which was way closer than it needed to be – really shouldn’t change that gut feeling. This team is much like the 1986 Eagles, which went 5-10-1 in the first year of Buddy Ryan’s coaching tenure but laid the groundwork as holes were filled to fit the new personality. The year before, they were a boring 7-9 under Marion Campbell (technically 6-9 under Campbell, as they won the final game under interim coach Fred Bruney), but no one dare argue they were better off. “You got a winner in town,” were Ryan’s first official words when introduced as the new coach. Despite a step back on the tally sheet in the first year, no one dared to doubt it. There was a new attitude, a new pride, a new sway. They were young and tough and opponents, even more talented opponents, were not thrilled about having them on the slate. The Eagles were getting their groove back. What goes around generally comes around. And it’s coming around again. This entry was posted in Sports on September 14, 2013 by gordonglantz.